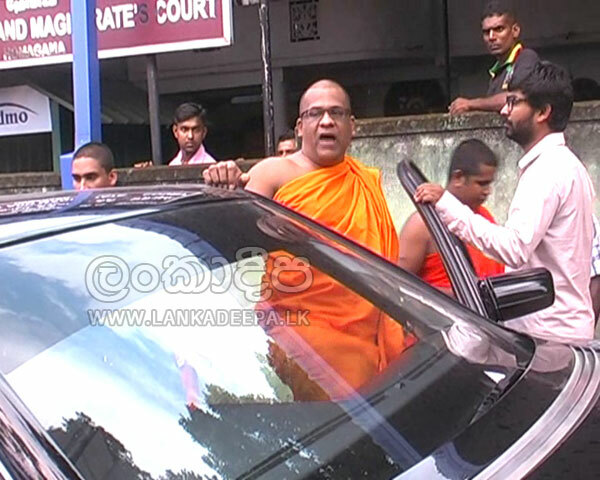 (Lanka-e-News -25.Jan.2016, 11.45PM) When Prageeth Ekneliyagoda case was taken up for trial today(25) , Galagoda Aththe Gnanasara the monk in robes addressing the court forcibly, threatened and scolded Ekneliyagoda’s wife in foul and filthy language . Owing to this conduct he was ordered by the Homagama magistrate to be arrested immediately based on 4 charges and produced in court based on four charges: contempt of court ; threatening state officers; intimidating and instilling grave fear; and obstructing the court’s administration of justice. Just when the Ekneliyagoda case was over and while the next case was being called up , Gnanassara who broke into the court along with some monks, forcibly addressed the court . He said , 'he does not fear the laws of the black ‘whites’' and by force delivered a statement within the court- ‘Tigers are out. Members of the forces are in’ and so forth which had startled the magistrate who was dumbfounded by the sudden melodramatic and rowdy behavior of the monk. At that moment , a state counsel Dileepa Peiris who is appearing for the plaintiff in Ekneliyagoda case had come forward and said , somebody who is not a party to the case cannot be allowed to address court by force . Gnanassara has then begun turning his tirade against the state counsel . He had screamed 'he does not fear State counsels , and threatened him' too. Subsequently when all the lawyers who were in the court protested that this type of conduct cannot be permitted within court , Gnanassara walking out had physically knocked against Sandya Ekeneliyagoda who was outside , and threatened her while saying ‘ your husband is a Tiger. You go and beg in the streets.’ He had also threatened a journalist who was with her . It is well to recall ,Gnanassara prior to this at a media briefing said , he would not step into court for any case. Gnanassara who risked even his life to save Gotabaya , a notorious mass murderer , seemingly has need to go to jail and become a hero when he knows deep within his bones he is even below zero vis a vis the poor public respect he commands despite being a monk in saffron robes. Even Lord Buddha must be turning cartwheels in his grave being unable to bear the scorn and insult monks of Ganassara caliber are pouring on true Buddhism he preached. The Ekneliyagoda trial began today , and the army officers who are suspects were produced in court . The lawyers for the army told court that so far the body of Ekneliyagoda had not been found , and as his wife too does not consider him as dead, this is not a crime. The lawyers for Prageeth and the state counsel of the Attorney General’s department countering this suggestion , pointed out this is a case that is built on circumstantial evidence , and the army officers abducted Ekneliyagoda. Besides , there is evidence that the victim was in the custody of the army officers until the end. The Magistrate postponed the trial until the 9 th of next month , while also ordering that the suspects be held in remand custody until that date. This bugger must be f _ _ _ ed. someone should remove his robe and make him walk naked. He is a disgrace to everyone and everything.